I had the pleasure last weekend of returning to my alma mater, the University of Virginia, to attend the 2014 Virginia Film Festival in Charlottesville. Though I was only able to stay for one day, I caught three outstanding movies at the beautifully restored Paramount Theater on the revitalized Downtown Mall. 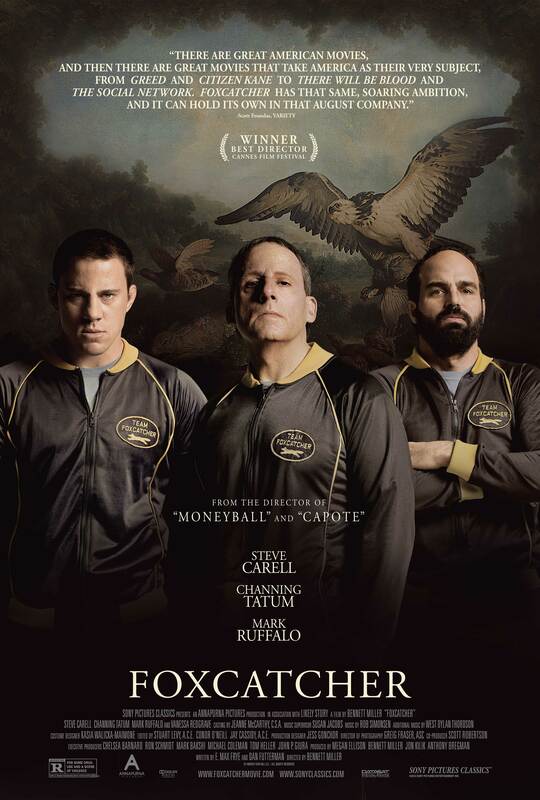 The one you’ve probably heard the most about is Foxcatcher, which opens today in limited release and will be expanding across the country soon. It’s already generated tons of Oscar buzz for stars Steve Carell, Channing Tatum and Mark Ruffalo as well as director Bennett Miller—and with good reason. This movie—the tale of America’s richest man, John DuPont (Steve Carell, bringing new meaning to Despicable Me), and his tragic involvement with the gold-medal winning Olympic wrestlers Mark and David Schultz (Tatum and Ruffalo)—pins you to the proverbial mat from its first scene and never lets up. Combining elements of Miller’s stellar first two films—Capote‘s true crime and Moneyball‘s sports drama—Foxcatcher affirms Miller as one of America’s finest filmmakers. He’s working from a brilliant script by Dan Futterman (who also wrote Capote) and E. Max Frye (finally delivering on the promise of his debut screenplay, 1986’s Something Wild). The real test of the film’s Oscar strength will be if Vanessa Redgrave can earn a supporting actress nomination for her brief, almost wordless role as DuPont’s domineering mother. She’s absolutely riveting in only a few scenes, and the fact that Carell and Tatum can hold their own as dramatic actors alongside her is a measure of their surprising depth. Another heavyweight Oscar contender, Barry Levinson’s The Humbling, marks a long-overdue return to form for the filmmaker as well as for star Al Pacino. He delivers a tour de force as a suicidal stage actor in this darkly hilarious adaptation of a Philip Roth novel. The Bard of Newark has proven difficult to translate to the big screen (the last attempt was Robert Benton’s tragic-for-all-the-wrong-reasons The Human Stain in 2003), but the screenplay—co-written by Buck Henry!—departs from the book in significant and highly entertaining ways. Shot in 20 days for $2 million, The Humbling may be overshadowed by the thematically similar Birdman, but it deserves serious consideration on its own for Best Actor, Director and Screenplay. The flawless ensemble also includes Greta Gerwig (whose appeal I finally understand) as a young lesbian who’s enamored with Pacino’s aging thespian, Dianne Wiest and Dan Hedaya as her baffled parents and the always-wonderful Charles Grodin as Pacino’s long-suffering agent. Plus, Kyra Sedgwick—who’s been doing amazingly diverse post-Closer work in Time out of Mind, Brooklyn Nine-Nine as well as here—Dylan Baker, Broadway babies Billy Porter and Nina Arianda and more. The biggest surprise of my moviegoing day was 5 to 7, the big-screen directorial debut of Mad About You and Mad Men writer Victor Levin. On paper, it sounds annoying: the story of an aspiring NYC writer (Anton Yelchin, whose appeal I also finally understand) who falls in love with a French diplomat’s wife (Skyfall‘s Bérénice Marlohe) but can only see her between 5 and 7 pm, hence the title. On screen, however, this is the most charming romantic comedy I’ve seen in ages. It’s completely unformulaic and unexpected, and it’s graced by laugh-out-loud turns by the great Frank Langella and Glenn Close as Yelchin’s parents. I don’t want to spoil any of 5 to 7‘s surprises, but suffice it to say there are many, and you should seek it out when it opens next year. As for me, I’ll be returning to the Virginia Film Festival next year—and I’ll be staying for more than one day.